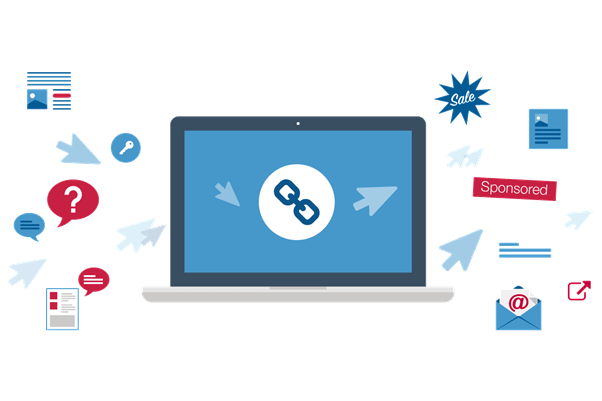 Link Building, It’s all about how to get quality, relevant backlinks to your website. If you are new to SEO, you are probably wondering how to achieve this. In general, it is about creating external links for a domain to generate web authority and thereby improve organic positioning in search engines. But that’s just the beginning; it gets a little bit complicated than just that. At this point you will be asking yourself, what is the purpose of it? Why do I need it? Why do I need any of this? Links are like greetings, which is, the more greetings we receive and the more important the website that has greeted us, the more authority we will have. But be careful, it’s not just about popularity. Effective link building is about trust and popularity. So, we already have the general lines of Link Building. Now let’s try to dissect this concept into something digestible by the average user without SEO experience. A backlink is any link to your website that appears on any other third party web page. URL: or landing page to which the link takes us. Title: I recommend that the links include a title attribute, which explains to the user where the link will take them. Like in this the title is “The Rules of Link Building: The 2019 Guide”. Anchor text: is the text that contains the link, the “visible part of the link,” and is the most important SEO element. This anchor text must be equally consistent with the content. Images: it may be the case that the link is located in an image. In this case, when you click on the image, it will redirect you to the webpage indicated on that link. To preserve the value of the text that works as anchor text is vital to include the alternative text, alt attribute, which must be descriptive of the content of the image. Depending on whether we want the search engines to consider these external links or not, we will have the “follow” or “nofollow” links. We can locate them in the source code of the page with the rel attribute with the value “follow” in case we want the search engine to take into account the popularity of the link, or “nofollow” if we do not want to transmit our popularity to it. If we talk about nofollow, it will normally be advisable to use it when the content we link does not have our full confidence or guarantee. Inbound links if they are links on external websites that link to yours and provide you with an inbound link to your website. Outgoing links that are those used to link third party websites from your website. However, you should also know that there are other types of links as they depend on the language of the link, the sector of the website, the type of domain, its authority, and so on. You can also check the complete guide on Nofollow Vs. Dofollow links. 4. How is link building done? The first part of any link building strategy is always creating high-quality content that is worthy of a backlink from relevant sites. Keep in mind this, the strength or authority that are transferring the backlinks you have to your website is a factor that determines the situation in which you are. Don’t you get it? In fact, it is very simple. The links that point to our page will be relevant to the search engines if they come from a page with recognized authority. If a web page that has authority on the internet recommends your content, it will make your website benefit from its value. “what is this dude talking about? I have seen hundreds of people who use this technique to position their web pages”. Well, a PBN is created to trick Google and make new websites grow quickly, that is, kind of “cheating” Google. What did you think? That they were not going to find out?. Well, they do, and now if they catch you trying to do that, you will be severely penalized. To give you an idea of how Google can penalize you, I’ll point out which are the two ways to do it. This type of penalty is more complex because you do not receive a notification as it happens with manual penalties. Normally you realize that you are suffering from it when you detect a marked decline in visitors in Google Analytics. The complexity of this penalty is that you have to find out for yourself what the problem is, and try to solve it. Meaning, If you get caught red-handed, you can kiss goodbye to your project. So, think about what to do? Keep on reading; it gets better and better. 7. How to build quality backlinks? According to Neil Patel “If you want to build links without getting penalized, you must understand and work closely with Google’s mission statement. If you fail to do that, the technique won’t work”. 8. Avoid quick generation of links to new content. Most link building services recommend trying to build links slowly, that way Google will index your content slowly. Otherwise, you risk your website to be considered over-optimized and might be red-flagged. The consequence? Your website will get familiar with “The Sandbox Effect.” I mean, you still get indexed but not ranked. Like when you are a child and misbehave, and your parents tell you that as punishment you that you can go to the ice cream parlor, but you can’t eat ice cream. The “Sandbox” is a form of penalty imposed on new websites by Google, kind of quarantine, but more of a waiting period or testing phase for new websites. But why do these new webs need to be tested? Perhaps someone made a mistake and started stuffing a site with tons of keywords, or sending thousands of spammy links. Sure they were trying to boost a site on the SERPs and ended up getting just the opposite effect. See the importance of trying to build links slowly? It is useless to create links on websites that deal with plants (for example) if yours is about online marketing. It is important to link the companies with which you collaborate: suppliers, intermediaries, etc. Create content alluding to their work and their products. Based on these related content link to their website, direct your users to go to these sites and consult what your collaborators have to offer. Remember, always try to link to sites with quality content, because that directly affects the trust, your trust. Moz recommends that 90% of your effort should go into creating great content, and 10% into link building. I don´t know about you, but I’m starting to see a pattern here: Quality content matters to link building. Currently, there are many ways to build links effectively, thinking about it I leave you three strategies that I think can be very useful if you plan to venture into link building. Consists in the publication of your articles on websites of others that accept this type of publications. But, why would you want to write in someone else’s blog?. Simple, if your guest article has been good, the reader will not hesitate to enter your blog to see what other content you offer. On the other hand, guest posting is a win-win activity. The owners of the blogs that give you the opportunity to write, get in return a free content that interests his audience. You can take a look at the guide to Guest blogging. It is a strategy which acquires links by finding broken links, reproducing that broken link’s content, and helping webmasters convert broken links with your corrected link for link building purposes. When done right, provides fresh content to the web while helping your site to land on a list of backlinks. Check relevant content for dead links. Contact website owners to alert them of a broken link and offer a relevant link of yours to replace it. It works because nobody wants dead links on their website; they contribute to a poor user experience, which affects the position of your website in the SERPs. It is a technique that consists of taking advantage of the opportunities offered by news events to highlight the name of a brand and get in touch with the actors and information flows of interest. Diverting the attention of the audience towards brands and gaining notoriety. But as simple as it sounds, you must be very careful because a badly planned action can pose a serious reputation problem for your brand. Why? Because the use of a news fact can generate adepts or detractors. Those last ones can be very annoying, so be very careful with this strategy. Try to build links slowly, remember the penalties. The link building is not a popularity contest that consists of getting more links to win over your competitors. It is advisable to look for pages with a theme similar to yours. Always publish quality content and share it on your social networks, etc. encouraging your followers to read and share in their pages. Guest Posting Or Link Building: Which Is The Best Option? Great post! You have shared a very good informative post. I wasn’t much aware about link building and how it works. your post gives in-depth account of how it should be done. Glad to be here again and read a wonderful post about link building. Without proper link building strategy, it is impossible to rank hing in search ranking. Thanks for sharing such an informative artilce on link building. Very interesting to read and can easily understand, Thanks for sharing. A lot of things to pick from this post. An in-depth study (Guide) on link building. Many of my misconceptions removed by reading this post. I am glad that my post was helpful to you. Link building importance is declining quite fast and now most of the pages which rank well has bigger optimized content and less but relevant links. Many people I have seen they still do spamming and go for non-industry relevant links. You are right, private blog networks are the worst. You have to pay a subscription for being considered and later on, you have the fear of getting a Google Penalty. I think writing a content and doing a client outreach is one of the best and sure way to make sure that the link you got is legit. I follow Brian Dean and his techniques are always awesome. I have stopped working with PBN for a long time now. And I also encourage others to not to do that. Although, Thanks for the comments.